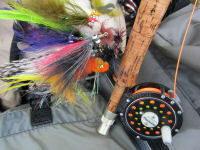 I recently found this excellent fly fishing article written by Eric Stroup and taken from Common Sense Fly Fishing. I came across this while reading from MidCurrent Fly Fishing. Eric goes in depth and discusses one of the most fundamental elements of casting and catching…line control. He discusses that to be effective you have to have line control at all times and the easiest way to do this is by using your index finger of your rod hand (for us righties it is our right index finger). Frankly I am not sure why all fly fisherman don’t or won’t use their index finger…but if you are a streamer/stripper fisherman then using your index finger is a necessity…or I guess you can chew at your line like a Doberman as described in the column? Learn to use the index finger and you will stay in contact with your fish thus allowing you to catch more fish….I promise! Secondly, Eric discusses going to the reel. Once again I concur totally as I really don’t go to the reel at all…if it is a big fish, they will take enough line to get you on the reel and if not…then use your index finger to strip and secure enough line to land the fish. If you watch any or many of my videos, you can see that I use a stripping guard that my wife makes for me from a cheap piece of Lycra. The stripping guard allows me to both stay in contact while fighting a fish…but make small-micro strips….all while feeling small touches and contacts by the fish. So….give this excellent piece a read…then practice your line control and you WILL catch more fish this upcoming year.